March 18, 2011 by Anthony Palombo, D.C.
We’ve been considering the role of the cell in facilitating the healing process, sharing some of Dr. Gary Samuelson’s booklet The Science of Healing Revealed – New Insights into Redox Signaling. In this post we will look at the basic concept of the cell’s function in manufacturing protein molecules, the fundamental building blocks of our anatomy. 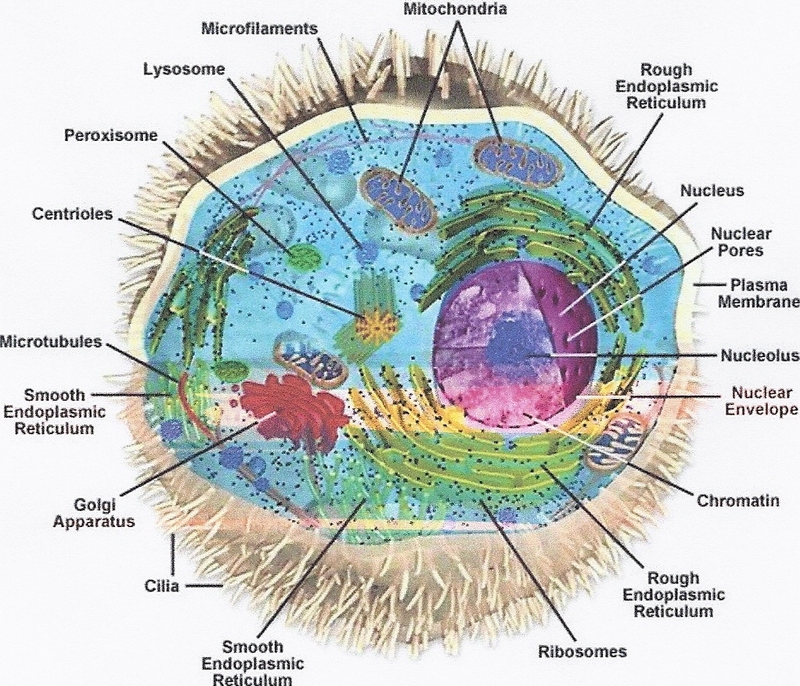 All life processes take place inside of our cells. In the simplest definition, a cell is a tiny bag filled with salt water and organic chemicals. The bag itself is made out of a bi-lipid [phospholipid] membrane (3 thin sheet that has waterproof layers on both sides and a thin layer of fat [cholesterol] in between). Note the need for cholesterol in the cell structure, not at all the “bad” thing medicine and pharma would have us believe. Balance and ratio, as in all things, is the primary factor. In the middle of each cell there is another smaller double bag (made from two bi-lipid membranes) that contains the nucleus and DNA. The DNA [Deoxyibonucleic Acid] has encoded instructions on how and when to build the proteins that the cell uses. A DNA strand is made out of two molecular spines twisted into a double helix. Between the spines there can be found only four distinct types of molecules called nucleotides (labeled A,T,C,G) which are arranged in sequenced groups like rungs on a ladder. Groups of three of these rungs are called “codons” (A-T-G1 for example). The exact sequence of these codons in the DNA strand determines the specific order in which amino acids are chained together (called polypeptide chains) in order to form proteins, thousands and thousands of different varieties. Most of the cell’s machinery and inner structure is formed out of the proteins manufactured from these genetic instructions. One exception to this rule is the formation of an organelle called the Mitochondrion. The Mitochondria (plural) contain their own DNA (called mtDNA) formed in circular strands and they divide and reproduce inside the cell much like bacteria divide, but are controlled and regulated by protein messengers from the nucleus. The Mitochondria’s primary job is to efficiently produce the fuel (ATP) that energizes the micro machines inside the cell that carry out the life processes. There are anywhere from 10 to 5000 Mitochondria in a typical cell, taking up to 50% of the cell’s volume. In theory, the DNA sequences of instructions (genes) inside any given cell in your body are entirely identical to the DNA sequences (genes) that are in every other cell (with the exception of the reproductive cells). Lately researchers have cloned whole animals by placing the DNA from a single skin cell inside an empty egg cell. The egg cell starts to divide and form a complete organism. The DNA package Inside every ceil in the animal has all of the instructions necessary to form a whole new animal. This begs the question: If the DNA in every cell is identical, then how does there come to be so many different varieties of cells and tissues, brain cells, bone cells, skin cells, liver cells, etc.? The answer to this question is found in the understanding that the individual cells do not act alone they are grouped and bound together into tissues. This entry was posted in Alternative Healthcare, Antioxidants, ASEA, Cell Biology, Cellular metabolism, Cholesterol Myths, Dr. Palombo's blog, Free Radicals, Healing, Health Newsletter, HealthLight, Herbal therapies, Human Consciousness, Immune system, Inner Ear Infection, Life of the Cell, Longevity, nutrition, Nutritional therapies, Reactive molecules, Redox signaling molecule, Staph Infection, Strep, Supplements, The Healing Process, Uncategorized, Virus, Vitamin supplements, Vitamins, Whole Foods and tagged Alternative medicine, ASEA, Cell Biology, Food supplements, human consciousness, nutrition, Whole Foods. The overall effect of the colorful five minute Inner Life of the Cell video clip dropped my jaw… but a moment came which was as startling as seeing the first man on the moon—the little worker cell attached by a cord to a huge mass of floating material, dragging it through the cell to where it was needed, by walking one step at a time! This is a must see! Thank you, Dr. Tony, for reawakening my sense of awe at the beauty and truth of my own body and its myriad cells. More than ever, I want to help these tireless workers in my body—by eating and doing the right thing. Thanks for your exciting comments, Stan. I continue to be in awe and I’ve been working with the wisdom of the body for nearly half a century. Now I want all my clients and friends to be as impressed as I am. What a wonderful world we have inside our bodies, even inside of a single cell!